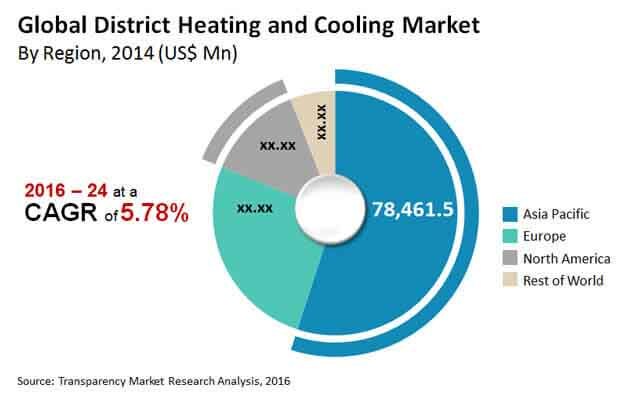 The global district heating and cooling (DHC) market features a low concentration of component suppliers with no big players. Most companies operate at local or regional levels where proximity to consumers helps avoid extra operational costs and efficiency losses, states Transparency Market Research in a new report. The market dynamics are highly susceptible to changes in terms of technology and scale of projects. “As DHC systems mostly belong to state-owned entities, government support and funding play a key role in operational efficiency of a DHC project,” states a TMR analyst. TMR estimates that the global market for direct heating and cooling systems will exhibit a 5.8% CAGR and a 6.2% CAGR over the period between 2016 and 2024, in terms of energy sales volumes and revenue, respectively. At this pace, the market is expected to rise to a revenue-wise valuation of US$243,428.3 mn by 2024. In terms of energy sales volume, the market is expected to reach 12,187,491.8 tera joules by 2024. The segment of district heating is presently the leading technology in the market, accounting for a share of over 90% in the global market in 2015. In the same year, Asia Pacific accounted for a dominant share of over 55% of the global market in 2015. Of the key distribution machines and tools utilized in DHC systems, the segment of pipes leads with a 60% share in global market’s overall revenues owing to constant expansion of pipeline infrastructure, falling prices of pipes, and the need for timely renovations of distribution networks. DHC systems demonstrate excellent flexibility in terms of the use of different kinds of energy options, depending on the condition of the utility grid and load profile. DHC system operators can easily switch between available heat sources in case of sudden variations in heat generation costs in the market. This not only ensures that overall costs of operation are kept in check, but also helps run the system at relatively higher capacities by ensuring a steady supply of economical heat generation options. Along with this factor, conducive regulatory mechanisms and incentive schemes, which play a key role in faster market penetration and reinstating investor confidence for companies, is also expected to increase capacity additions in the district heating and cooling sectors globally in the next few years. The overall cost savings achieved owing to the installation of district-wide heating and cooling systems are also key to the expansion of district heating and cooling systems globally. Studies have demonstrated that DHC systems lead to a significant drop in the overall boiler and staffing expenditures, while also boosting the efficiency of boilers. The sizeable reduction in the overall fuel required to run these systems owing to their fuel efficient nature also make them environmentally more viable than conventional heating and cooling systems. Also, DHC systems scale up very well as the number of households they serve increase, require less space for operation, and also ensure better management of equipment. The high initial costs required for the construction of plants, pipeline network, and connections necessary to run district heating and cooling systems is a chief factor hindering their widespread adoption globally. The need for several vital and expensive equipment for running DHC systems, such as heat absorbers, boilers, heat accumulators, chillers, heat pumps, and heat exchangers add to the overhead costs necessary to install DHC systems. The payback periods of DHC systems are also relatively longer, ranging from 8-20 years, making private bodies hesitant about investments in these systems. Along with these factors, the increasing share of decentralized energy systems, with the advent of renewables and off-grid energy systems, globally is also a key restraint to the overall growth of the global DHC market. As an increasing number of households and commercial/industrial facilities produce heat and electricity through CHP and renewable sources, the demand for centralized district heating and cooling mechanisms could suffer.